After an evening in Grand Junction we hit the road headed for Pueblo. The group had the option to head straight to Pueblo or detour to the Gateway Museum along the way. We opted to take the I-50 in the direction of Pueblo. 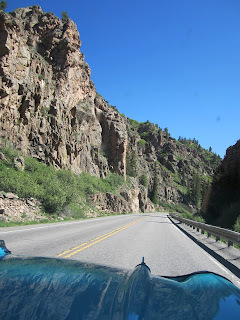 We wanted to enjoy the drive and take the time to spot in some of the small towns on the drive. 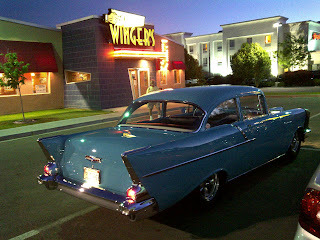 But because of the options, we ended up cruising solo all the way to Pueblo. We stopped for our first photo op of the day at Lake Fork. It was the cleanest the car would be all day until we had a chance to clean it with some Golden Shine products at the hotel tonight. We didn't know what the next town was going to look like, so we stopped at a RV Park for some gas. We met some nice ladies in the office who helped us with lunch suggestions in Gunnison and gave us the details on their upcoming Rubber Duck Race in July 3rd. Gunnison was a great little town. 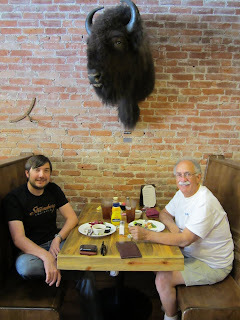 We took some time to check out some stores and have lunch with a friend at the Old Miner Steakhouse. 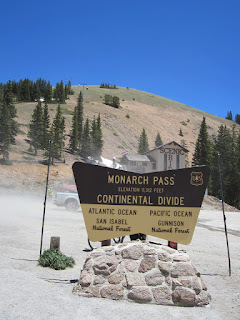 From there we headed towards Monarch Pass. We enjoyed the drive all the way up. 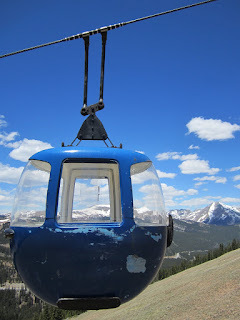 Since we weren't in a rush I took the gondola ride all the way to the top. There were some nice views from the Observation Deck over 12,000 ft up. The railroad along the I-50 was a resting place for seemingly hundreds of old train cars along the Arkansas River. The next point of interest along the drive was the Royal Gorge and suspension bridge. We opted to go inside the park and check out the attraction. Who knows when we will be back in the I-50. On the way back to the highway we took a lap through the Starlight Motor Lodge. It had a few restored vintage cars and trailers that guests can rent. It was a unique place. 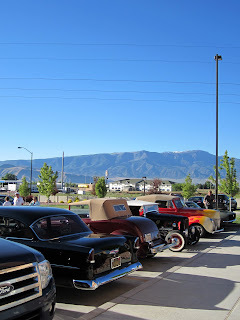 From there we cruised through Canon City and ended up in Pueblo in time register for the NSRA event this weekend and clean the car before dinner. Thanks for following along with us all week. 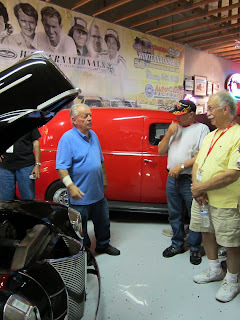 We had a great time with Jerry Dixey and the group of drivers from all over the country. 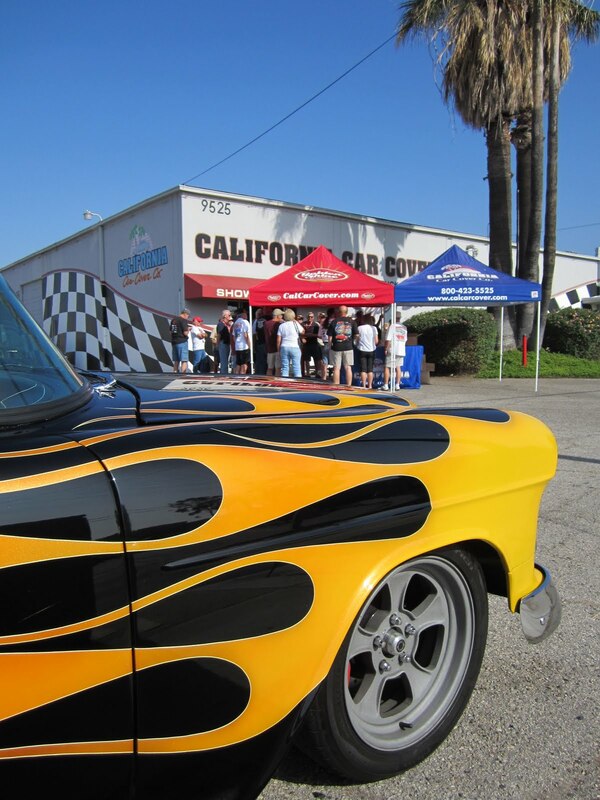 We are glad that Golden Shine and California Car Cover could be supporters of the Street Rodder Road Tour. The complete photo highlights from the drive and show are on our Flickr page now. 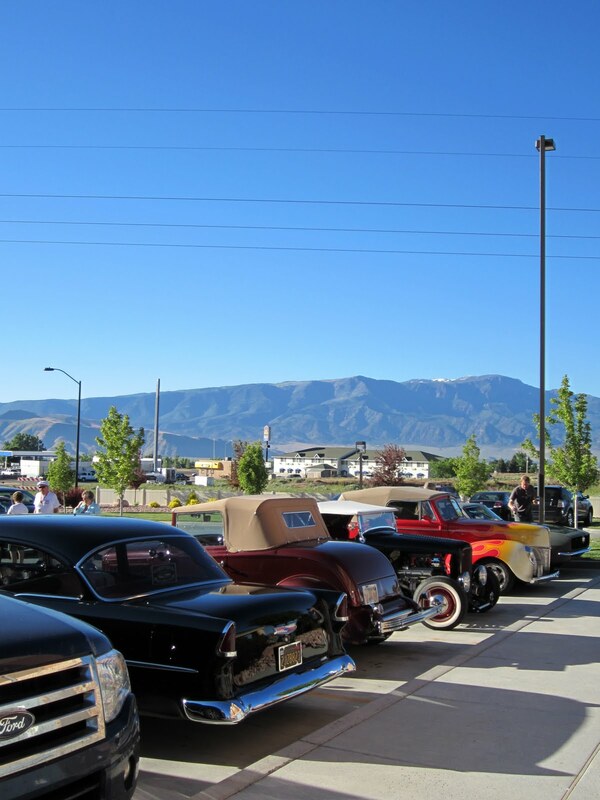 Street Rodder's Website has photos and videos from the tour as well. 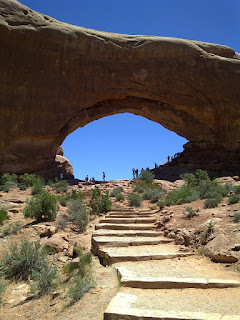 On Wednesday, our group left the hotel in Richfield, Utah and headed towards Moab and the Arches National Park. We spent most of the drive on I-70 cruising by ourselves, but every once in a while we would see a fellow classic car driver in the rear window. 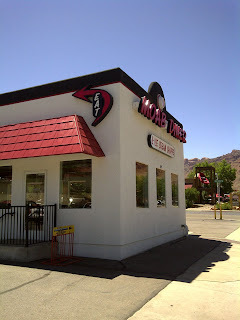 Most everyone stopped in Moab to grab a bite to eat. The small town is definitely geared towards the outdoor lovers. Just above every store could rent you a raft or ATV. A few of us happened upon the Moab Diner at the end of town. It was a great find. 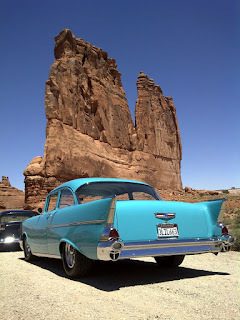 After some sandwiches and fries we cruised back up the road to the Arches National Park. 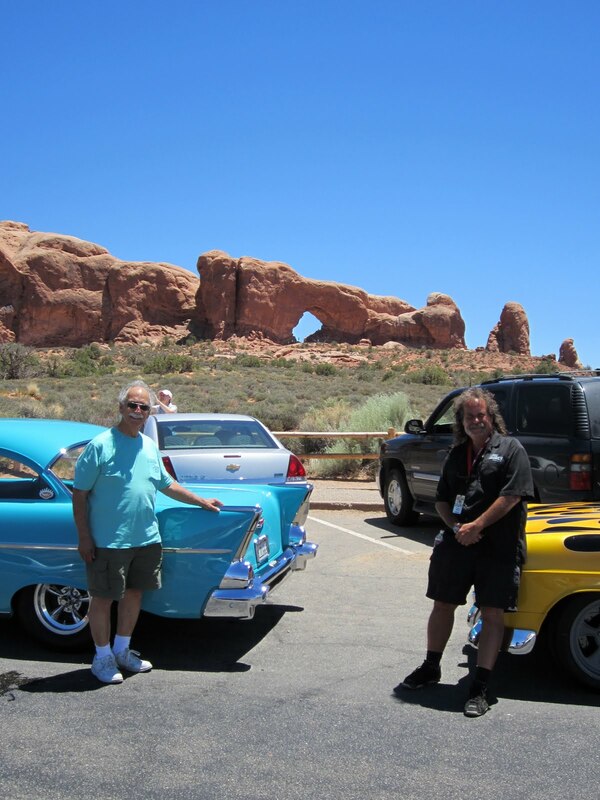 At the entrance to the park we ran into Road Tour Coordinator, Jerry Dixey (on the right), at the main entrance. We decided to cruise into the park together and snap some photos. While the boys were waiting for their engines to cool a bit, I opted to hike the trail out to some of the incredible arches. 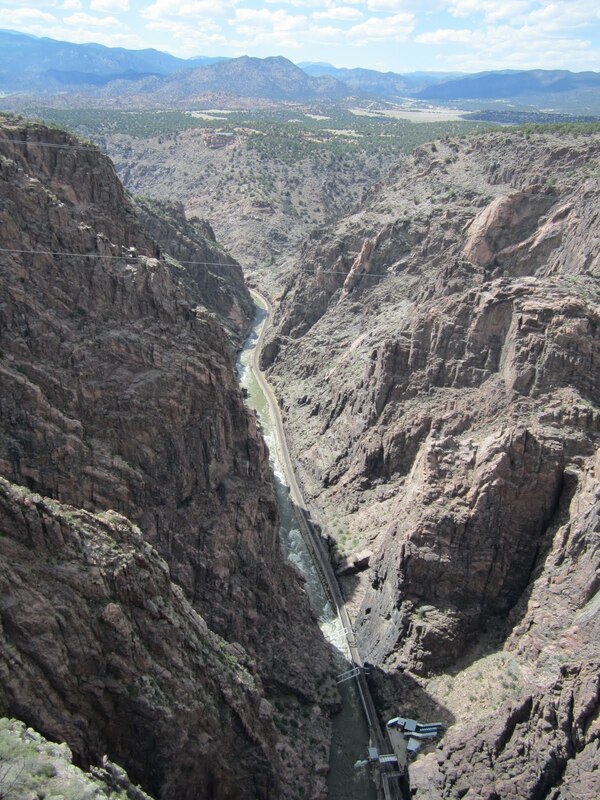 After we left the Arches National Park we continued along the Colorado River on the UT-128. We need a fill up on the approach to Grand Junction and stopped off in Loma. I saw this general store which was pretty cool. 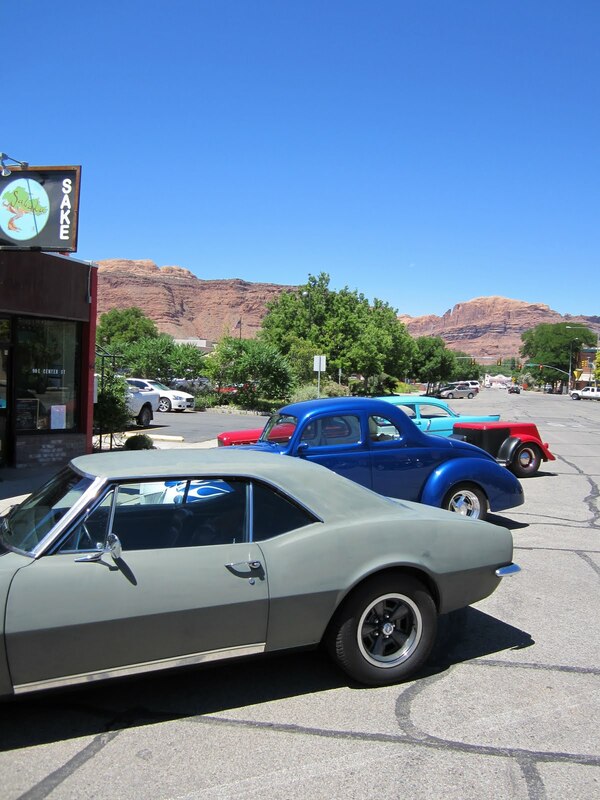 Our first stop in Grand Junction was Allen Unique Autos. 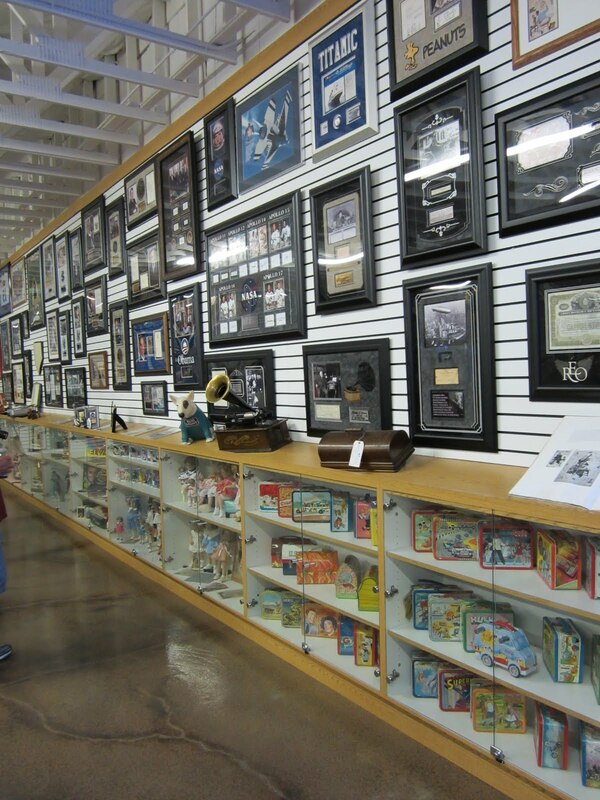 The auto collection is owned by Tami Allen, a frequent buyer at the Barrett-Jackson car auction in Scottsdale. We were not allowed to take photos inside the facility, but it is well worth the trip if you are in the Grand Junction area. When we arrived at the museum, a local news channel was there to interview Jerry and me about the tour. The Golden Shine Tour came to an end for the night in downtown Grand Junction. After cleaning the car and putting one of our California Car Covers on it, we took a stroll down Main St. before calling it a night. 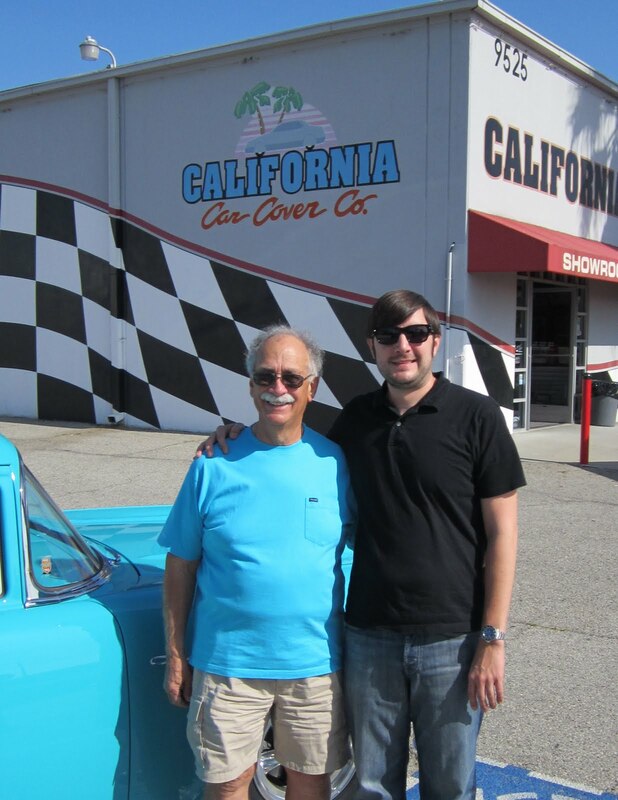 For more info on California Car Cover and Golden Shine, please visit our website. 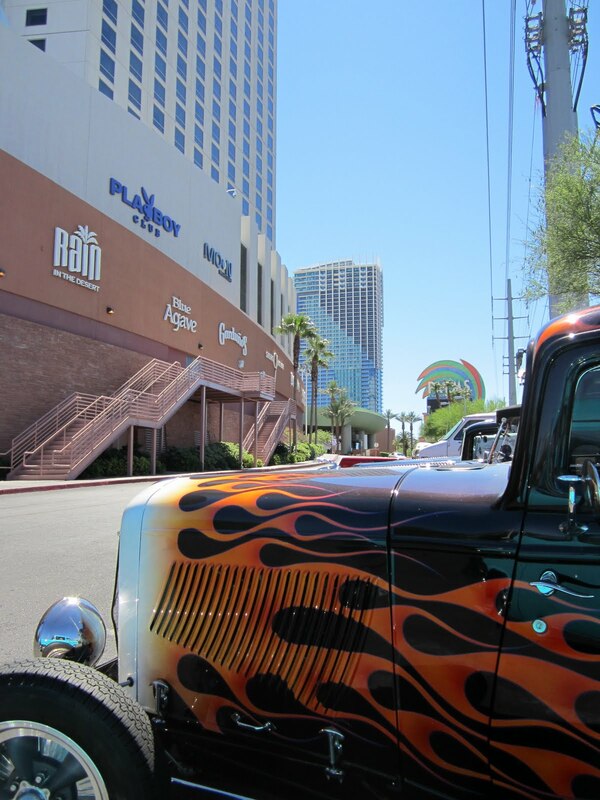 To see the tour from Jerry's point of view, please visit the Street Rodder site. 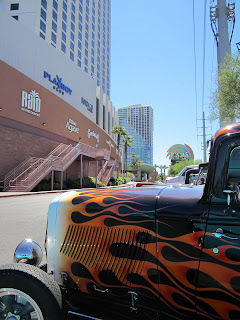 All participants of the Street Rodder Road Tour met in the parking structure at the Palms Casino for our driver's meeting. After the meeting we all cruised up the I-15 to Las Vegas Motor Speedway for a tour of the racing facilities and the adjacent headquarters of Shelby America. Our guides took us up in a luxury box for a view of the entire Nascar track. We also enjoyed a quick lap around the Bullring racetrack in our tour van. The next stop was the headquarters for Shelby America. We were not allowed to take photos inside the production rooms, but there were quite a few Shelby vehicles on display in the showroom. One cool part of the town was the autograph wall. Since customers always asked for him to sign their Shelby vehicles he asks everyone that goes on the tour to sign the walls. You will see my name on the wall above. 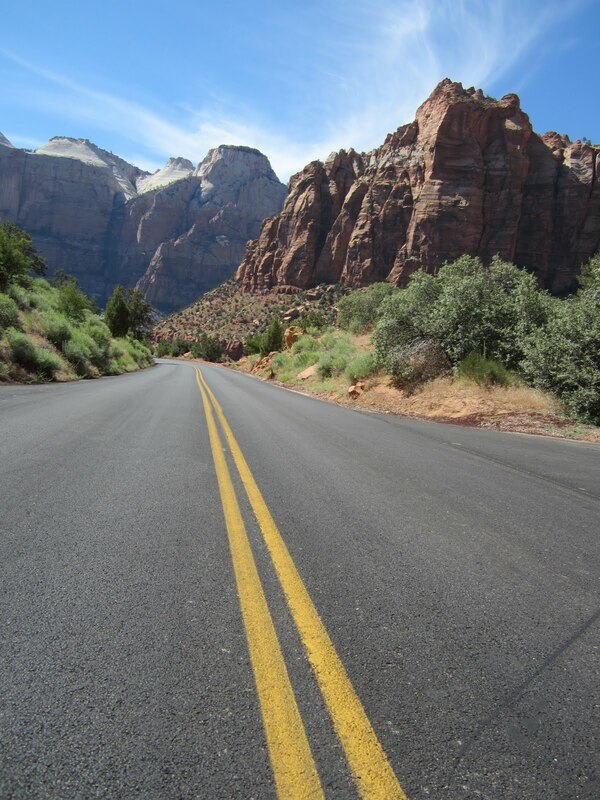 Golden Shine Tour participants were given the option to stay on I-15 all the way to Richfield or take the slower, more scenic route through Zion National Park. We took the drive through Zion and it was well worth it. There were plenty of long tunnels and windy roads, but it was a sight to see. On the way to Richfield, Pops spotted a junkyard full of classic Chevys. So of course we had to get out and take a tour. Terry, the owner of Another Man's Treasure was friendly enough to show us around. There are a bunch of the cars on the drive, so everyone splits up along the way. We cruised with a few other cars most of the day. By the time we hit Panguitch we were ready for some pizza. After our break, we kept driving through small town after small town along Route 89. It was great to see all the small towns, old farms, rivers and streams along the highway. We finally made it to Richfield, Utah for the night. Just in time to get some dinner at the only restaurant still open down the street. A few of our fellow drivers had some mechanical issues along the way, but at least we all made it to Richfield. 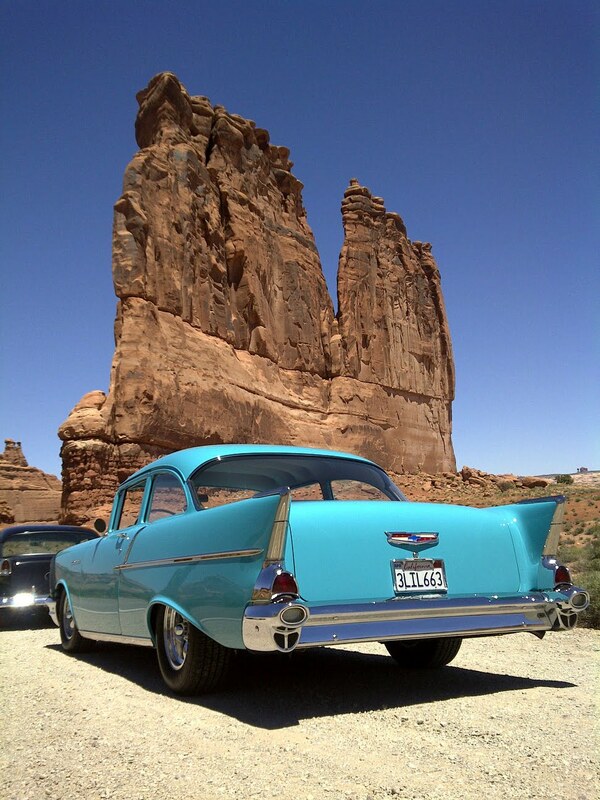 Wednesday, we are off to Moab and the Arches National Park on the way to Grand Junction, Colorado. Once there, we will be checking out some classic cars and monuments. The Golden Shine leg of the Street Rodder Road Tour kicked off from the headquarters of California Car Cover this morning. More than 20 classic cars left Chatsworth, Ca headed for Las Vegas, NV (our night #1 destination). Jerry Dixey, the Tour Coordinator, gave each participant a briefing of what is in store for everyone over the next few days. My father, Jim DeFrank, and I, Tony, will be driving along with the tour all the way to our final destination in Pueblo, Colorado. 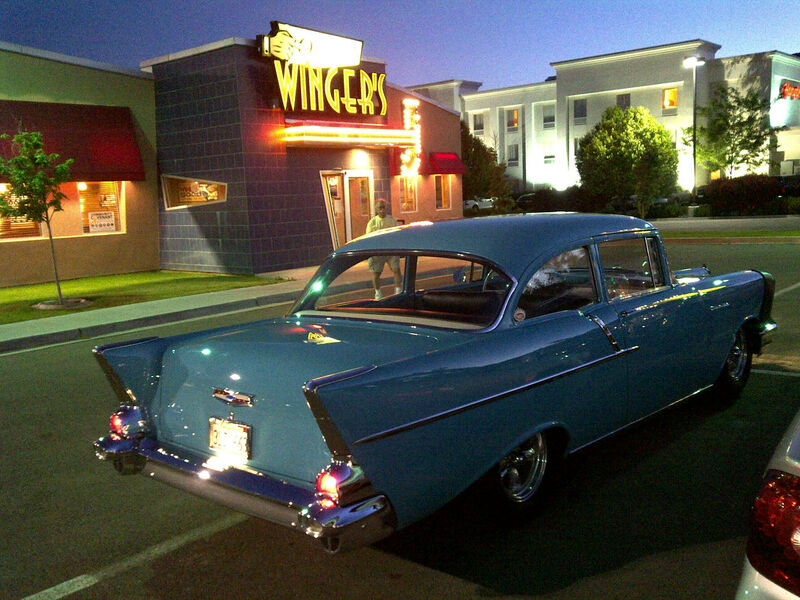 We will be cruising Pops' 1957 Chevy all the way to the NSRA Nationals this upcoming weekend. Our first stop was of course lunch. Most drivers opted to each lunch at the In N' Out Burger in Barstow, Ca which is about half way to Las Vegas. 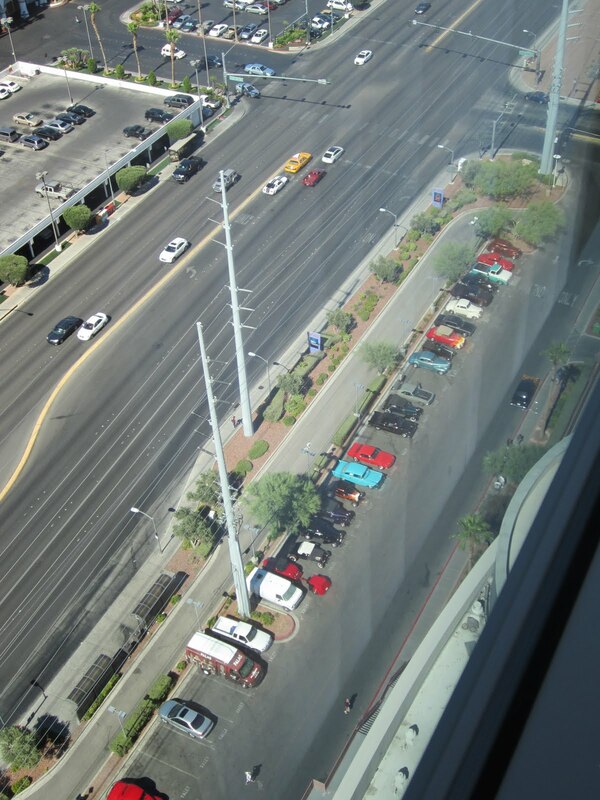 Here is a view of the cars on the Golden Shine Tour from our room. After relaxing and regrouping the convoy headed over to the impressive automobile collection of Art Goldstrom. 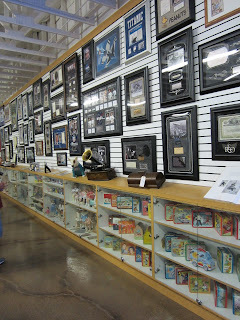 Art's collection of classics, race cars and memorabilia fills quite a few buildings. It was quite a sight for the participants. Art's wife is also a collector. I was a fan of her collection of vintage lunch boxes. 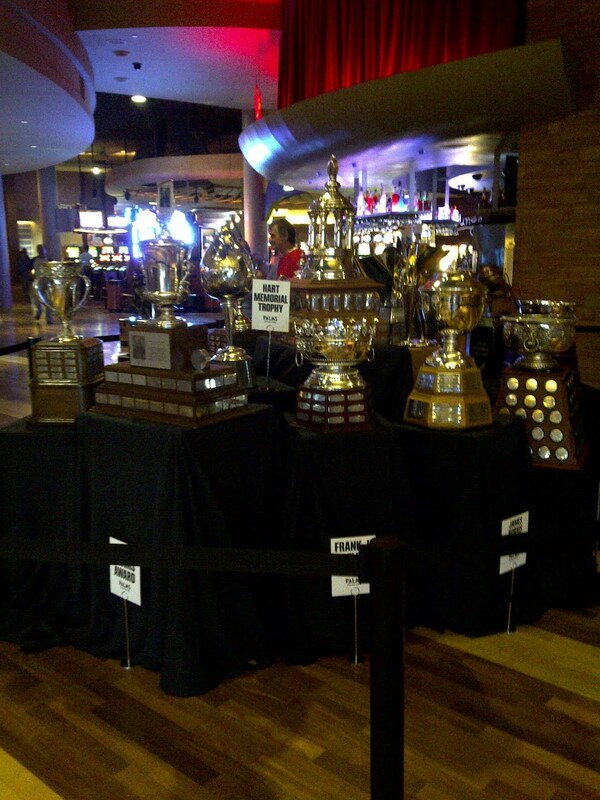 Though unrelated to the tour, I was excited to see the collection of NHL trophies on display at the Palms. 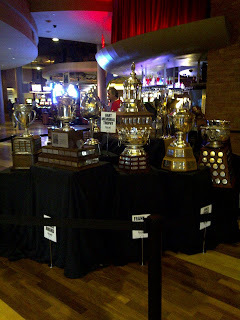 The NHL awards are at the Palms in a few days, so it was cool to see all the history. We are done for the night and getting ready for our drive to Richfield, Utah tomorrow. 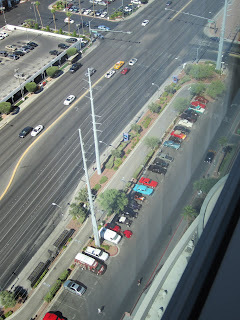 We will be stopping at the Las Vegas Motor Speedway and Shelby America facilities on our way out of town. Jerry from Street Rodder will covering the Street Rodder Road Tour blog as well. You can view his take of the tour on the Street Rodder website.